While this weekend felt absolutely nothing like fall (Yesterday was in the 80’s and it’s the end of October! ), these cookies taste just like it! The aroma of the spices and the pumpkin make your home feel warm and cozy (and perhaps slightly hot if you make them on an 80 degree day!). My husband downed these little guys in no time. Since cookies were snitched before the pumpkin pie dip was made, we had leftover dip with no cookies. We discovered that it makes a great spread for bagels! So, if you don’t like ginger cookies, make the dip and use it for bagels or perhaps snickerdoodles. . .yum! Preheat oven to 350. Line a baking sheet with parchment paper or lightly spray with non-stick cooking spray. In the bowl of a stand mixer, cream together butter and sugars. Add in egg and beat until creamy. Beat in molasses and water until well-combined. In a medium bowl, whisk together flour, baking soda, cinnamon, ginger, cloves, and salt. Slowly add dry ingredients to wet ingredients. Dough will be stiff and you may need to finish combining ingredients using a wooden spoon. Roll dough into 1 – inch balls. Roll dough in sugar to coat. Place dough onto baking sheet. Press dough to indent ball slightly. Bake for 8-10 minutes or until cookies puff and edges start to turn light golden brown. Allow cookies to cool for a couple of minutes before transferring to a wire rack to finish cooling. While cookies are cooling, begin preparing pumpkin dip. Cream together cream cheese and pumpkin until smooth. Slowly beat in confectioner’s sugar, cinnamon, nutmeg, allspice, ginger, and cloves until creamy. Store leftover cookies in an air-tight container and leftover dip in the refrigerator. This recipe is linked with Crazy Sweet Tuesday, I’m Lovin’ It Friday, Lil’ Luna Link Party, Strut Your Stuff Saturday, Sweet Treats and Swanky Stuff, Tuesday Talent Show, Weekend Potluck, What’s Shakin’ Link Party. Awesome love this recipe! Its a little different than mine, and your cookies are smaller which I like, so I think I will be using your recipe tomorrow at my baking class at homeschool coop! Thanks for sharing! Holy molycakes. 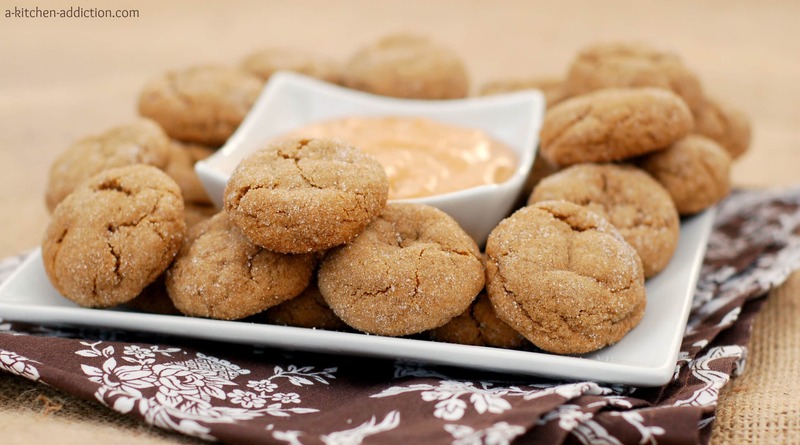 From the soft-baked gingersnaps (seriously, one of the best holiday cookies ever!) to that creamy pumpkin pie dip, I am drooling all over my keyboard! I love this set-up.. so perfect! I love being able to bring comforting recipes to the table, giving us the season of fall (even though it may not seem like it outside). These cookies do exactly that, and it’s just what I need in 80 degree LA weather! YUM! oh m y goodness, these cookies look so cute and pop-in-my-mouth delicious! YUM! and with the dip… to die for! I’m afraid these didn’t last long at our house, too addicting! I love this idea of cookies and dip! Great for this season’s parties! Oh my! I absolutely love ginger! These ginger cookies have me over the moon! I like that they are bite sized and the dip is a great compliment! I suspect I’d eat the cookies before the dip was made too! Totally love this. I’m the same way, even though it’s still way too hot here, I’m still partaking in fall foods. Yu-um! This looks delicious. Combining my husband’s 2 favorite things: gingerbread and pumpkin pie. If you give them a try, I’d love to hear what you think of them! It wasn’t until a few years ago that I liked ginger. . .I used to be the same way! Oh dear! My husband would love it if it made 36 dozen, but I would definitely be sick of making cookies! 🙂 Thanks for catching that! I love soft gingersnaps, and this dip looks amazing. What a great appetizer/dessert. Love it! OMG! Pinning! These are my favorite cookies! I think I’m going to make gigantic cookies this year for Christmas. Cookies with dip?! Oh my goodness! This looks so good and so festive for fall. I love, love ginger cookies and I can only imagine the dip takes them over the top! These cookies are super cute. I love all things mini. I enjoyed all things this weekend with the gorgeous weather. LOVE the looks of these itty bitty cookies!! And a pumpkin dip to enjoy them with?! I’m sold! I can’t get enough ginger EVER but especially not at this time of year. These cookies sound AMAZING. these look so soft and perfect…and that dip. how fun! my boys would love! I heart pumpkin pie dip!! i love this dip idea, jessica! 🙂 amazing. it hasn’t felt like fall here either (today is supposed to be 79) but i sure have been eating like it!! I was reading this and literally was drooling. I had to stop! These are going on my to-bake list. Damn, that thing is getting long! 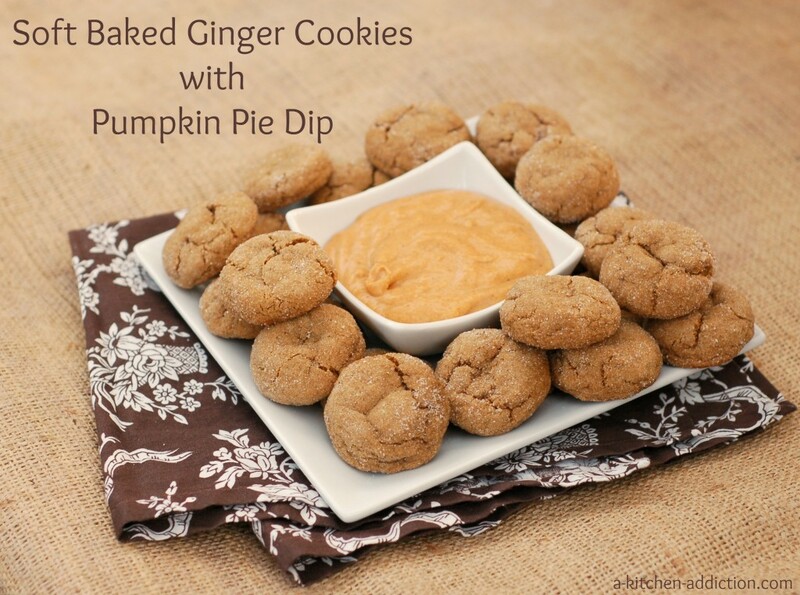 I have been tooling around other blogs and never ceased to be amazed at the variety of pumpkin recipes, but I have to say that i never would have thought of a dip for cookies! What a fantastic idea, especially for an adult party (or mixed-age group). I agree with Emma; my list is also getting long but this idea and the recipe are too good not to add. These cookies are like little, soft pillows of yumminess! Get out of here with these!! 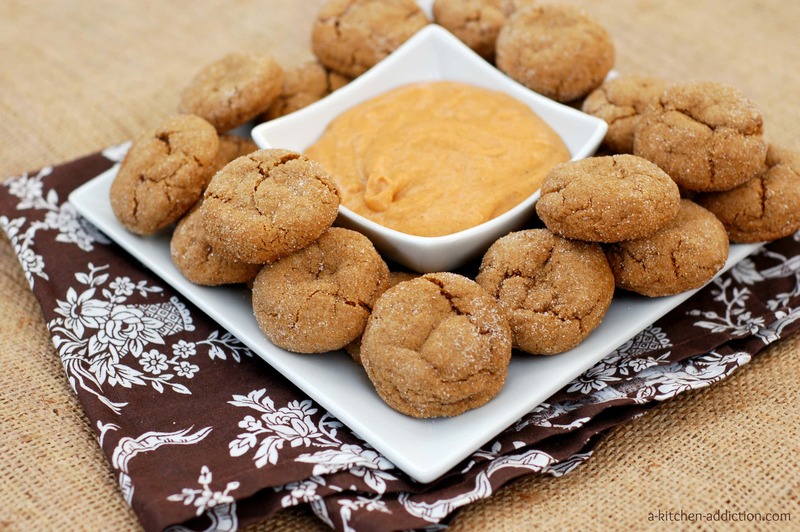 I mean ginger cookies are already to die for, but then dipping them into creamy pumpkin dip!! I DIE. Great idea with the pumpkin pie dip! So cute. Why can’t I think of things like this?! I was so impressed with your idea of a cookie dip that it inspired me at the last minute to whip up something of my own, with an unexpected bonus! 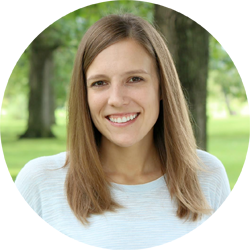 I put a link to your site up on mine, giving you inspirational credit.